How far away are we from dystopia? Much of modern day media asks it’s audience this very question, with shows like Black Mirror acting as an eerie peep show into a not-so-distant and frighteningly possible future. How far can technology go? It may seem space-age to think of a time where humans and robots could live in parallel with each other, interacting, working, perhaps even falling in love, but are we really that far off? With Sophia the Robot being granted citizenship of Saudi Arabia, perhaps we are already there. HumansBeingDigital is an exhibition currently running at The Lowry which seeks to close the gap between technology and human emotion through different artist’s interpretations. Where technology is seen as cold and inhuman and its presence maybe even sinister, the artists seek to question and confront this idea, using digital means to evoke human emotion, entwining the two and blurring the lines. 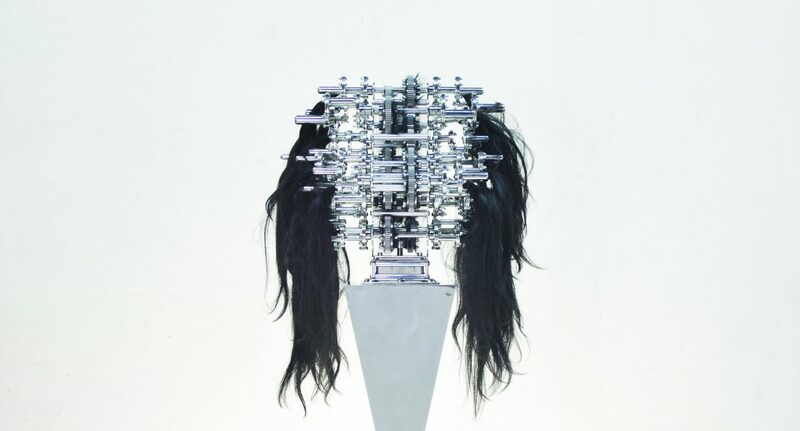 As you walk into the room you are confronted with the first piece, a contraption of hair and machine cogs by U_Joo+LimheeYoung. It took me some amount of perplexed gawping to come to terms with what I was seeing. As the cogs in my own brain turned, I asked myself, why is this so creepy? It immediately reminded me of horror stories from a GCSE DT health and safety class that forewarned loose hair near the machines. Ouch. But perhaps the piece was saying something else entirely. Capitalist exploitation treats the labour force like machines, tirelessly working long hours in repetitive jobs for a low wage, was this strange hair creature a socialist statement? Or maybe the piece was a nod to the future of robotics, and the ever humanised nature of the robots that are being created? Either way, U_Joo+LimheeYoung made me stop in my tracks and really wonder, are we that different from machines? The display takes you on a walking tour of the funny, the peculiar and even the beautiful. You’ll find a recording of Housewives Making Drugs, a parody cooking show by Mary Magicc, hosted by two trans-femme chefs who provide their audience with a step-by-step guide to cooking their own hormones at home. You could try and gain entry to A Hipster Bar by Max Dovey, but be warned, the bouncer comes in the form of facial recognition technology that will deem what percent hipster you are, so if you’ve not got a handlebar moustache, there’s a high chance you won’t get in. My favourite piece, however, could be easily missed. To your immediate right on entry, behind a black curtain, you’ll find a bright white room. You might be advised to stay to the carpeted area, because the rest of the floor is a bit slippery. During performance times — which are 11am and 4pm Sunday-Friday and 10am and 4pm on Saturdays — you can witness something simple, but pretty wonderful (if a little deafening). Thom Kubli’s Black Hole Horizon consists of three giant horns generating compressed air which in turn blows giant, soapy bubbles across the room. The atmosphere when the performance started was one of childish whimsey, with every pop of a bubble causing a pleased murmur of delight from the audience. The foghorn sounds from the compressed air are like that of industrial sized ships, loud and abrasive, while the bubbles they produce are fragile, catching colours in the light, filled with a soft nostalgia. Nine artists display their work in The Lowry for the HumansBeingDigital exhibit, which finishes on the 25th February 2018. Catch it while it’s still here, or before Sofia the Robot inevitably takes over the world.